Our executive villa has 3750 sqft of living space including sun deck for your comfort, completed to an extremely high standard and is situated on a premium lot which is not overlooked by neighbouring properties. Our villa is superbly located and has been designed to cater for your perfect dream holiday. The Villa is situated on the exclusive Calabay Parc development on highway 27 and is close to both interstate 4 and highway 192 with its vast array of restaurants, shops and bars. 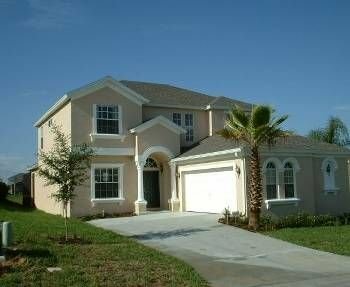 Although only minutes away from Walt Disney World Resort the community is in a peaceful location and is conveniently situated for all major attractions. Orlando Airport is only 25 minutes away and Sanford Airport is fifty minutes away. We have designed or villa to be spacious and luxurious with all the amenities you need to make the trip of your dreams complete. It is the perfect place to relax and you will always look forward to returning at the end of the day. You have all the home comforts and when the children go to bed you can relax around the pool and share a drink or two. The villa is fully air conditioned and beautifully furnished it comprises 3 master en-suite bedrooms 2 with king-size bed and one with a queen. The main master bathroom has his n hers sinks, large corner tub and separate double shower and toilet. The second master bathroom has a double shower and toilet whilst the third master bathroom has a bath, shower and toilet. Plus there is Two Disney themed twin bedrooms with shared bathroom . All rooms have ceiling fans, Cable T.V, walk-in wardrobes and One master bedroom has patio doors leading to the pool and patio area. All linen and Towels are included and there is a hairdryer in each bathroom.Two of the master bathrooms have hair straightners. For the children we provide free use of a cot, highchair and pushchair, a stair gate,baby monitor and cot bedding is also provided. For your children’s safety there is a security fence provided and all doors to the pool area are fitted with safety alarms. There is a separate utility room with washer and separate dryer, Iron and ironing board. A double garage and beautiful landscaped gardens. There is a large family lounge with Cable T.V ,DVD player with movies, CD Player and telephone. The lounge overlooks the pool area with patio doors leading to the Sun Deck and pool. The villa backs onto a retention pond and is not overlooked. The pool is very large at (30 x15ft), there is a large heatable jacuzzi with water cascade. The deck area has been extended and because it is South Facing it enjoys the sun all day. Should you prefer there is also a shaded area under the lanai complete with ceiling fan, the pool can be lit at night giving a relaxed atmosphere for you to enjoy whilst dining Alfreso. There is enough luxury furniture for all to enjoy. Pool heating is available and the area is screened to provide a bug free environment. Pool toys are also provided. The open plan dining and kitchen area with patio doors leading to the sun deck and pool area, features a large fully equipped kitchen with built in hob and oven, microwave, fridge/freezer with ice maker and cold water dispenser, dishwasher etc. There is a breakfast bar and a formal dinning table. If all that isnt enough there is even a Games room complete with full size pool table, table top football and electronic darts and many more games and toys. Staying at our Villa will be a holiday you will never forget. You can be assured that our management company are on hand 24 hours a day and nothing is to much trouble for them should you require any further information or assistance.